The elephant in the screening room that sat in the back row wasn't symbolic of the Republican Party as much as it was George Orwell. The metaphor just sat there quietly watching Oliver Stone's latest film called Snowden with everyone else, while all of us weighed whether national security is more important than privacy; or to put it another way: is personal privacy more important than the safety and future of our country. The dilemma deepened as the story of Edward Snowden's blowing of a loud and shrill whistle on the National Security Agency for its overreaching and covert surveillance of Americans and most other earthly things has technologically proliferated at full throttle. The film is immaculately constructed and communicates with amazing clarity. It's set in the Hong Kong hotel where Snowden (Joseph Gordon-Levitt) has fled from the United States; the venue in which he unloads his data to the care of Glenn Greenwald (Zachary Quinto) of The Guardian and Laura Poitras (Melissa Leo) who made Citizenfour, the Academy Award winning documentary of Snowden. Having not delved into Snowden's backstory, the picture told me he has a history of epilepsy. I mention this only because the visuals Stone puts to these fleeing scenes are almost as remarkable as his use of the film montage. Look for them. You might be slightly amazed, especially with the montage that ends with a close up of a human eye. Gordon-Levitt has been impressive in his previous films. He steps solidly forward in his young acting career to really nail being Snowden. 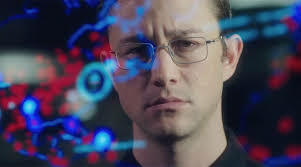 It became especially obvious following the feature when, through the miracle of satellite communications, I got to see moments when Snowden, himself in Moscow, would speak with Gordon-Levitt who was situated in New York City. This was a special event that made it possible for me to see Snowden, then watch on the same screen, a conversation that included Snowden, Gordon-Levitt, Shailene Woodley (she plays Snowden girl friend Lindsay), Stone and a moderator. This is an important motion picture to see … whether you think Snowden is a hero or a traitor. It's about how a government should balance its duty to keep a nation secure and protect the privacy of people who live in it. Too bad, the crowd was sparse. I have to confess, I was surprised. Snowden is a hot topic wherever you come down on it. Yet, Snowden has all the tension, suspense and even action that the ho-hum, routine movies usually have for selling popcorn, soda and tickets. Shortly before the film began, a gentlemen with a beard was just arriving. On seeing the few of us seated in the auditorium, he shouted out something to the effect, “Ah, we're the ones who really care.” It was due to our diminutive number that we all seemed to bond. Snowden opens wide for all Friday, September 16th. Be there! Copyright © 2016 by Gary Chew. All right reserved.